Is virtual reality a bubble? That’s a common question in a number of panels I’ve covered in the past year. The answer isn’t quite knowable until a major event comes along that either expands or pops the bubble. Digi-Capital reported that venture capitalists invested $500 million in augmented reality and VR during the third quarter, with 65 percent of that money coming from mainstream traditional VCs. At that rate, VR is consuming a measurable part of VC investments in the world. Digi-Capital estimates AR and VR could be a $120 billion business by 2020. To get some insight into those numbers, I moderated a panel on investing in virtual reality and augmented reality at Greenlight Insights’ recent Virtual Reality Strategy conference in San Francisco. The panel included Toby Zhang, cofounder of the Youku Global Media Fund, a joint early stage venture fund between CRCM and Youku. It focuses on media, AR/VR, and A.I. Our second speaker was Marco DeMiroz, partner at the $50 million Venture Reality Fund, which focuses on VR, augmented reality, and mixed reality. And it also included Michael Yang, managing director at Comcast Ventures in the Bay Area. Above: VR investors Marco DeMiroz (left), Toby Zhang, and Michael Yang. Toby Zhang: I’m a partner with Youku Global Media Fund and CRCM in San Francisco. Most recently we launched a frontier technology fund investing actively in VR and AI. It’s a joint venture with Youku. We’re looking very actively in the space, in the U.S. and in China as well. I hope I can share some insights from what we’ve seen overseas. It’s a very new and interesting area for us. Marco DeMiroz: My partner and I quit our jobs and thought we had a once in a lifetime opportunity to invest in VR, AR, and MR. It’s a $50 million fund. We’re very actively investing in the space. Currently we have 14 companies in the portfolio, and we’ll probably end the year with close to 20. Michael Yang: I’m a managing director with Comcast Ventures, based here in the Bay Area. I lead our VR, AR, and MR investing efforts among other categories we invest in as a multi-sector, multi-stage fund. We’re the direct investment vehicle for Comcast corporation. We’ve been around for 17 years. We’ve invested in seven VR and AR companies, including some with Marco’s fund. GamesBeat: Marco, how many panels like this have you been on? DeMiroz: It’s kind of become the Michael and Marco show, yeah. We’re not a YouTube hit yet or anything like that, but in the last month or so we’ve done three together. Part of the challenge, and maybe the opportunity as well, is there’s still a very small number of traditional venture funds and venture investors in the sector. Obviously Youku is a corporate investor with great distribution capability and strategic benefits. For us to continue to work with the traditional venture community and expand that circle — as you said, like 60 percent of recent investment came from traditional funds. Part of the reason this is happening, companies that saw investment early on are now raising their traditional A and B rounds. Our recommendation to them is to go and get a lead from a traditional venture fund, so you can have price credibility. You have a partner who’ll be patient and persistent and stay with you for a long time. We’re very interested in expanding the circle, but for a while it’ll be the Marco, Michael, and Toby show. Then hopefully we’ll see other groups joining us. GamesBeat: Michael, where are you stepping in compared to someone who’s very early stage? Yang: Of the seven investments we’ve done, we’ve led three of them. Of those three, two were series A and one was a C. The other four we’ve participated in have been either series A or a seed round. Frankly, there is no mid-stage or late-stage opportunity as yet, given the nascency of the business. If you want to participate, you either jump in with both feet or continue to sit on the sidelines. As much as we all love Tim [Merel] over at Digi-Capital, I have a hard time reconciling his data. I don’t see the same trends he does as far as mainstream Sandhill Road venture capitalists coming in. GamesBeat: If you take [big transactions] out for [the data in the past year] and see what everything else looks like, maybe you get a better picture? DeMiroz: Yeah, I think he has a little exuberance in his numbers. But fundamentally, the current run rate is about five percent of U.S. venture capital investments. The U.S. normally does about $50 billion a year, more or less, in a traditional market. If we’re talking about a $2 billion to 2.5 billion a year run rate — like you said, about a year and a half ago, from a venture fund perspective, it was a very small percentage. Now we’re up to five percent. [Correction: The $2 billion a year refers to global VR investment numbers, while the $50 billion U.S. figure is a subset of the global investment number, so the percentage stated is not accurate]. From our perspective, it’s much better for the sector to have these venture funds beyond Comcast. Others need to follow their lead and come into the market, not only to establish price credibility, but also to provide persistent and patient capital for these companies to grow. Zhang: Looking back over the past year and a half to where we are today, things have definitely shifted. VR was very hyped for a while. Money has flown in both from the west coast of the U.S. and the east coast in China. Valuations are a little higher than in traditional venture areas. But things have calmed down a bit this year. We’ve seen prices and valuations start to normalize. Looking forward, we’re going to keep observing this trend. From an investor’s perspective, we’re looking for more than just a great business model or great technology. A company needs to have both. It needs to have a strategy to survive. The VR market is a very exciting new trend, but if it doesn’t take off as fast as everyone hopes, does a company have a way to continue to grow and get to a stable business? That’s what we’re looking for now. GamesBeat: Now that all the hardware has launched, you guys get to look at some of the results that are coming in for some of your portfolio companies. Are you encouraged by what you see? Not just in terms of units in the market, but are companies starting to generate revenue? Yang: I’m encouraged that all the major technology players have headsets either announced or on the market. That’s great. A lot of people ask why we’re interested in VR. Well, when was the last time you had so many global technology titans all piling in to one sector? They’re investing far more than the venture capital universe will ever contribute to this. It’s a great battle in front of us. We have to be careful that we don’t invest in things that these guys stomp on. They all have very immature platforms. They all have major deficiencies and gaps. Those are all very well-known. They’re working on them. We often hear startups working on middleware, middle-of-the-stack opportunities. To me that gets squishy. Ultimately your go-to-market is either OEMing it or licensing it to the platforms. Sure, there are a dozen or so of them globally, but it’s not a great place to be. You’re just setting yourself up to be acquired. We’re not choosing that. You either go all the way at the bottom of the stack or you go all the way to the top. For us, as much as people think it just makes sense for us to invest in content and apps and all that — we’re a media company, after all — we have at least in this year and a half seen a lot more investor support globally for things like apps and content. That might be a temporal thing, meaning there was a window of opportunity when you could invest against that thesis, but that doesn’t mean it’s a consistent, long-term investment thesis. Back to Toby’s comment earlier, the bar has risen. What we would have invested against last year we won’t this year, and we definitely won’t next year. Now that we all have portfolio, we know what the best can do in our portfolio. Those are the thresholds we’re looking for. DeMiroz: The trends are encouraging in the sense that — we’ve been monitoring Steam dynamics in the first four months. Cumulative revenues were about $20 million and ramping up. Sometimes you have to look at the data, what the world tells you, but early adopter behavior may not be sustained behavior. A lot of the time the price dynamics we can extract from app stores right now won’t indicate what will happen three years from now. There are bold platforms out there. Microsoft’s announcement for next year, with inside out positional tracking and so forth, that’s the direction we’re heading. We need our portfolio companies to have a multiplatform or platform-agnostic strategy and start executing, getting some data. All of our guidance to them has said, “Don’t have a long product development cycle. Get out there, get on multiple platforms, iterate like crazy, and continue to improve.” The early behavior model is not going to indicate what might happen later on. Zhang: Multiplatform, multiple form factors, that’s very important. One thing we’re also wanting to add is going into the mobile space. With what’s going on from Project Tango and Microsoft, there are definitely big players in this space. We need to grow and bring AR and VR into the mobile space. We’re paying close attention to this in startups. We want to make sure that, as a young startup, you’re not just positioned for the tethered experience, but also have a complementary or compatible mobile strategy. As the mobile market grows for AR and VR, startups need to be ready to make that transition and be present. Above: Pixvana lets you capture scenes in VR. DeMiroz: Mobile VR is going to be huge. I’m generally an optimist, of course. But it has to be very convenient. I can understand people having an HMD in their home and another HMD in their office. Aside from that, you need a form factor that you can carry with you. I had a phone case with built-in lenses, where you could flip a button and consume VR content. Hopefully that’s where we’re heading with mobile VR. What’s happened in the U.S., in the summer of 2011 we reached 100 million smartphone users. At that point the economic model shifted from premium to freemium. You had a critical mass of users to sustain a freemium economy. By the end of 2011 the freemium money exceeded premium money. That’s where we need to go. We see a lot of innovation coming from Chinese hardware manufacturers when it comes to very small form factors. If you go to Alibaba and do a search for “HMD,” you’ll see prices from $4 to $14. These are quality lenses. Some of them are super portable. But that’s what we need for mobile VR to take off. Question: What’s holding back financial investors? Yang: Most firms have one proponent of VR as an investor. One guy who’s a fan. Then there’s a lot of other partners who are highly skeptical. Unless you’re in a two-man shop where you only have to convince one other person, you have to go around and do a lot of politicking to convince your colleagues. You have to pick your battles as far as which things you want to try and push over the goal line. That’s why more traditional funds — really you only see one investment, maybe two in the portfolio. Unless you’re a dedicated fund or a really big believer or have a particular mandate, you’re not going to see more at this juncture. Question: What do you guys think the impact of web VR will be? DeMiroz: We’re big believers, and in fact we’re about to close a deal in the next couple of days. As you know, web VR has been sort of stalling. We didn’t know which direction it was going to go as far as how much support it was going to receive from the platforms. But recently both Google and Oculus have gotten behind it, and as a result we’re seeing accelerated adoption of web VR. It’s nice to have content delivery in a browser. You can have multi-mode consumption patterns. You should expect to see web VR coming up shortly. Zhang: It’s a space we’re actively looking at as well. Given how much penetration there is as far as the delivery medium, it’s an area we’re paying attention to. Above: Samsung’s Gear 360 and Gear VR headset. Question: From a prioritization standpoint as far as investments, are you looking for the next Magic Leap, or are you looking at content platforms, content creation, codecs? Zhang: For us, we look for certain areas, starting with enabling technologies, solving the most basic problems in VR. What’s the best way to stream data? What’s the best way to compress a large amount of data to reach a device? How do you stream assets to multiple platforms? We’re also looking at things like content production, content tools. Enabling technologies that help content creators figure out how they can get to market, that’s something we pay a lot of attention to. At the other end of the spectrum is content IP. We look at content creators as they come up with really interesting IP. Are they well-placed to leverage that in different markets? Can they distribute their content globally? Can they develop other content based on these initial explorations? That’s what we’re also looking at. DeMiroz: I can tell you, from our portfolio, out of the 14, five are in content and games. We’re creating a sub-portfolio of content and game companies. These tend to be smaller investments at earlier stages. Coming from a gaming background, I’ll note that a lot of PC and console developers couldn’t translate their IP to small rectangular screens. It was very different for them — asset management, user experience, funnels, the freemium model was very different. We’re seeing similar hesitation that great designers coming from mobile, PC, and console may not translate to the VR experience. VR gives you an incredible platform to tell great stories, but something like first-person shooting doesn’t do a lot for me in VR. It works on that rectangular screen. As we expand this portfolio of companies, we’ll probably invest in a dozen or so — early stage, different genres, multiple platforms. But our main portfolio of nine companies, as Michael said, will be at the bottom of the stack or the top of the stack, foundational technologies. We’re investors in Eonite, computer vision technology. We’re investors in Sliver, which is doing esports in VR. We’re investors in Visionary, which is a content creation platform. Michael and I invested in Spaces, which is another platform for content creation and deployment in theme parks. It’s almost a theme park OS. Those are fundamental technology providers that have immediate ability to monetize in the market. You don’t have to have hundreds of millions of devices out there. Yang: We look for founders who’ve been practicing the art of VR for at least a couple of years. We’re wary of Johnny-come-latelys who are just jumping in because it’s the cool new thing to do. You have to train. Like Marco just said, a lot of skills don’t carry over. We want to see that you’ve cleared those hurdles on your own time and on your own nickel because you come to us and ask for expensive capital. The other thing we’re looking for is a story you can tell that allows you to get the rounds of financing after the one we all come into. The first check is the easiest check. The second check is harder. There’s going to be a shakeout. We all know it’s coming. Whether or not your first round of investors will be there to support you — it’s going to be interesting to see what happens in that marketplace. We’ve been accelerating the financing process for most of our portfolio, encouraging them to go out rather quickly — far more quickly than in other sectors — to get it while you can get it. GamesBeat: I’m curious what advice you guys would give entrepreneurs as far as how they should think about valuation. DeMiroz: I’d suggest a balanced perspective. If you look at venture dynamics, a lot of times angel goes in one direction where VCs have significant leverage. In an emerging sector entrepreneurs have leverage because there’s a scarcity of talent. Nosebleeding at the either end of the spectrum doesn’t help. Like Michael said, if you get a great high-priced valuation, what do you do for your next round? You have to think about venture funding as a journey. You’re going through some of the alphabet. You get that A round and it gives you a platform to achieve your milestones. Then you have the B round. You have to deliver milestones and create successive validations of the growth model. If A is too aggressive — you see companies raising $2 million at $18 million pre. You have to execute flawlessly and build way beyond expectations to get a markup from there. It just doesn’t make sense. My recommendation is to come up with a model where both investors and founders get a decent ownership after the financing. You have partners who can stay with you for the rest of your journey. Zhang: In any early technology trends, there are those cases of runaway valuations. We’ve seen what the data says about valuation of companies like that. Survival rates are very tough. We’re wary of that, but at the same time, we encourage our founders to think about growth for the long term. Not just optimizing for right now, but optimizing for five years and further on. As far as valuations we’re observing currently, things are coming down a little bit. If you were to draw a map of valuations, the east coast of China has the highest valuations, then Silicon Valley, and then New York. In general, though, even the Chinese valuations are starting to come down. To us that’s an encouraging trend. We’ll see more companies survive in the long term. Question: For content that’s entertainment-focused, what are some of the monetization models that may work? A lot of money is going to content studios, but what are the exit strategies? Also, have you seen compelling vertically integrated content solutions? Targeting a specific niche market, for example, by addressing specific problems. Zhang: One thing we see is that Silicon Valley, and the west coast of the U.S. in general, is a huge exporter of content globally. Feature films go to China, they go to India, they go everywhere. Different spin-offs of that content are produced elsewhere as well. This is content that’s not cheap. It’s very expensive. If you take the Chinese market, for example, if you look at the cost of acquisition of content for a company like Tencent, these costs have close to doubled in the last couple of years. And as the IP gets better, there are more ways to monetize it. For any content, you want to get wide penetration. You want people to look at what you’re creating and follow it. But you have to find ways to monetize it, package it, and find distributors that are willing to work with you to get it to market. There are some things we can do to help in those areas. We can work with our studios in a model where they have great content and they want to get it on a global stage — find the right partners, help distribute, help find markets where that content can survive and grow. Yang: One area we think content works really well is in the health care vertical. I do a lot of health care investing outside of the VR context. There’s a lot of stuff in fitness, nutrition, diabetes management, and so on in a traditional context. Bringing health care into a more immersive environment and affecting behavioral change, we think, is very interesting. We’re seeing the beginnings of companies that want to go through health care providers to offer a VR-based solution to patients along various therapeutic regimens and protocols. We think that’s particularly interesting. Above: Oculus Rift is just the start of the VR marketplace. Question: You brought up the need to develop content based on the mobile platforms, based on where the market is now. It sounds like there’s a bit of a disconnect between wanting to invest right now, but also looking forward and investing in high-quality content. Are you keeping in mind that there might a merger coming, that mobile might become a high-quality experience going forward? And from a content perspective, how do you talk to your partners about creating that high-quality content, even though creators are kind of limited right now? Zhang: Talking about the different platforms, there’s definitely a spectrum of devices available for creators producing mobile VR content. For content creators, it’s good to have a strategy that fits all of them. Say you have an IP that’s interactive, that requires a lot of computing power. That’s interesting for a higher-end experience. But you might be able to come up with something that’s complementary to that on less powerful platforms. Mobile computing power is going to continue to improve. We’re going to see experiences on mobile that are very compelling and very interactive. A lot of the platform players are looking at adding peripheral devices. The mobile experience is going to become richer and that’s going to be an opportunity for content creators. When you think about your content play, right now it may not fit in both mobile and the higher-end experiences. But pretty soon the experiences are going to be closer on both platforms. Yang: If you’re a content creator you have to have a true north. What is it you want to create? What do you stand for? You can’t stand for all things to all people. If you truly want to be premium, optimize for premium. There are certain platforms that’s particularly good for. Then be honest with yourself. You’re going to have downscale the experience for some of the other platforms that can’t take advantage of the full immersive experience you’re trying to create. If you want to go at it in a big market at the lower end, just do that. But you have to have a point of view. Different pieces of IP and content you build have to be targeted. DeMiroz: With our content investment strategy, we have to see the manifestation of your vision. A lot of designers have ideas, but when that idea turns into a game it doesn’t necessarily translate that well. The other part is — again, we talked about multiplatform. You don’t have to be on everything at once. Some genres lend themselves to a high-end experience. Mobile translation may take a while to get there. Our portfolio company, Owlchemy Labs, with Job Simulator, it’s super popular. They’re going to be on every platform eventually but they have a platform deployment strategy. Another portfolio company, Against Gravity, has a game called Rec Room. It’s a social VR game. That will again be on all platforms, but it’ll also take some time to get there. You have to have an amazing user experience, no matter what platform you’re on. You need to deliver that as part of a multiplatform strategy. One thing we advocate is, don’t get into long-term, expensive, epic title development. We see titles with proposals coming to us that say, “I need $3 million to develop a vertical slice.” Does that mean you need $15 million for the whole game? More? There’s no market for that, which means there’s no investor appetite for it. GamesBeat: Is that where the platform holders are putting some of their own investment? DeMiroz: Not for a $3 million vertical slice. That’s really expensive. Again, if you have a console background that makes sense. You’re used to a 36-month development cycle and a massive team. VR is more like mobile. Get out there early. Be very nimble and flexible. Learn a lot, iterate, and improve. Money is coming from Oculus, Google, and others, but not at the scale some people expect to get. GamesBeat: I’m curious about something like Baobab as well. They raised $25 million. To me, that seems like an investment in one particular person, the guy who made Madagascar. Now he’s doing VR and he’s come up with a couple of funny VR shorts, interactive 360 videos. You expect the guy who made Madagascar to be able to do something good. That, to me, seems to be why they got that much money. What would be your view on that? DeMiroz: I’m the only non-investor up here. [laughs] I’m envious, because their team has phenomenal talent. They’re building great talent. When they raised the A round I didn’t have the fund in place, and the B round was out of our range. Yang: All of these businesses, especially the content studios — it’s too simple to just limit it to there being one great creative person involved. There are three legs to the stool. You have to have great creative, obviously, but you also need a great technologist and a great business person. If you look at the three cofounders of Baobab — Maureen Fan, Eric Darnell, and Larry Cutler — they represent those three pillars. Some of our other companies fit that model exactly, with a business person, a tech person, and a creative person. You can’t have two out of three, because then you’re unbalanced. If you only have one out of the three, you probably shouldn’t have taken the meeting in the first place. There’s a lot of tech being built here because it’s all breaking new ground. We think of these as full stack studios. It’s at a point where some of the tech being built is so novel and unique that it could be its own third-party business if we wanted it to be, but we’re keeping it proprietary because that affords an advantage relative to the rest of the industry. That might change down the road, but that’s a business discussion to have. Zhang: I’d agree that having the three-legged approach is very important. Particularly the creative side, because that’s more rare. You want to see those folks who’ve made blockbuster films and the like coming out of their comfort zone and saying, “This is a new area, but it’s where I want to put the next 10 years of my career.” We’re actively working with founders who’ve come out of other industries and are looking to impact VR. This is happening more in the U.S. at the moment. We’re seeing directors, creatives coming out of Hollywood and looking at AR and VR as an industry where they want to try themselves. In China we’re a little earlier in the process. We haven’t had too much success. But we’re still looking for creatives who are ready to found their own teams, find the tech people and the business people, and move into the VR space. Question: How are you thinking about the adoption curves for VR versus AR and MR over the next five years or more? To what extent are there places where you can hedge your bets on one platform or another? DeMiroz: The bigger picture is that there are fundamental differences between the sectors. It’s the dev kits. If you look at the dev kits for VR, more than 300,000 are out here. AR is in the low thousands. There’s an enormous capacity coming from the VR developer community not only for gaming and entertainment, but also for health care, manufacturing, education, travel, real estate. A lot of experimentation and innovation is happening with VR dev kits. AR is only getting started. Our long-term vision is that eventually we’ll have mixed reality devices that can do multiple modes, so you can do immersive VR and AR. Whatever happens transitionally in the next few years, the market will eventually coalesce into a single device model. That could be our primary communication and commerce environment. But currently VR and AR dynamics are really driven by the dev kits. The numbers are significantly different between the two communities. In AR, we have an investment in a computer vision company, as I said before. We’re looking at a lot of AR opportunities. If you look at Pokemon Go, that’s what some people call “weak AR.” It’s not necessarily related to the physical environment, but it’s laid over the physical environment. Beyond gaming, all across industry sectors, AR’s potential is enormous. It’s just that the developer community is way behind. 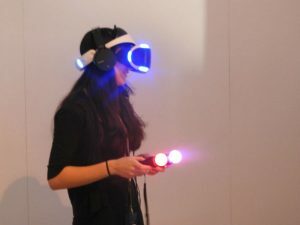 GamesBeat: What’s missing from VR platforms now? When you think these missing elements are going to arrive? We’ve gotten the sense that Facebook and Oculus are working on a wireless headset. Microsoft and Facebook have talked about inside out tracking. What else seems to be missing? Google recently bought Eyefluence for its eye tracking. Are there other things that will come in with the next rev of hardware, or might be even further out? Zhang: One aspect of technology I’m actively researching and looking into is something called volumetric capture, volumetric streaming. It’s a technology that’s not just for VR, but for AR and other applications down the road. The holy grail is to be able to feel like you’re on the court, playing alongside an athlete, live streaming that experience while it’s played. That’s the high end of the technology. It’s something I’m very passionate about. We’re actively looking at doing a deal in the space. DeMiroz: Volumetric capture and light field technologies, going forward — you’re going to want to have true presence. The beauty of VR is that you really want to feel like you’re part of the video or the interactive content. Volumetric asset capture and display, light field effects, all that is very important. Ultimately the price point has to be affordable. You have to have incredible content. You have to have a great publishing platform so content providers can monetize. But we’re looking at emerging opportunities. Question: You talked about the importance of smartphone-based VR. Best Buy has said that they’re expecting to sell $500 million worth of VR hardware this season, but with an average price point below $50, while means it’ll almost all be smartphone-based. I feel like there’s a disconnect between that and where the venture community is placing its dollars. They’re more focused on the home-based systems. Can you point to investments that you’ve made that are focused on that smartphone opportunity? DeMiroz: For us, we really invest in enabling technologies, foundational technologies for mobile, like Eonite doing inside out tracking and so forth. And also we’re investing on the content side. If you look at the content companies, game companies we’ve invested in, they’re all targeting both the high end and the low end, the latter being mobile. The Daydream will start a real growth in volume on the mobile front. Unfortunately, what happened with the Galaxy 7 didn’t help the sector. But with Daydream and Samsung and other devices coming next year, we should see significant mobile installed base growth. From our perspective, we’ll continue to invest in fundamental technologies that will empower mobile, as well as content for mobile platforms. Zhang: Mobile isn’t just a display. It’s also a capture device. One of the companies we’re working with enables this capture ability to live stream both 2D and 3D with the same camera sensor. It’s very exciting stuff. In the U.S. and Asia, live streaming is already a huge business, and we want to provide streamers with better technology in the AR and VR space. We want to make it possible to live stream in an AR setting, or stream yourself through your mobile phone. Yang: We’re all bullish on mobile. We don’t usually get the question about trying to prop up mobile. Usually we’re trying to defend premium stuff. Location-based VR, I think we’re all very big fans of that. There’s an opportunity there, especially globally.